Do you want the very best in streaming entertainment? We supply the very best internet connectivity. Our ultra fast fibre-optic network deliver up to 100 Gigabits per second that gets you connected in no time. We also offer you the addition of having your home phone services bundled all in one to make your connections simple and easy. Wether you have a household with Gamers, Connected Socials, Video Streamers or Web Surfers, we understand that not every home is the same. We give you the option to cater for your Internet and telephone needs. We offer a wide range of Internet access plans including Pivit ‘Make Your Own’ Plans and Pivit Freedom NBN Plans to suit any type of lifestyle. 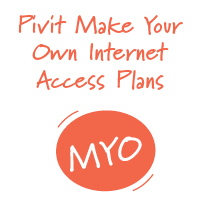 To Learn more about our Pivit’s ‘Make Your Own’ Residential Internet Plans click here. For more information on Pivit’s Freedom NBN Internet plans click here. We monitor our networks consistently and continuously to ensure the reliability and quality of your internet access. We build our networks to withstand the harsh Australian climate including remote access to ensure the best service delivery. We understand that you may need access to a telephone and would like to have this option. You can bundle a telephone with your internet service or have just a telephone service. Not all services listed are included in your standard service, please read our Residential Pricing and Services Guide for the full list of applicable costs. Pivit may provide the Free-to-air and Subscription or Pay TV services over our fibre optic network in your area and remove the need for unattractive TV antennas and satellite dishes. Contact us for more information today to find out about television services in your area.